Picanol is since 1998 active in Turkey with an own organization and with offices in Istanbul and Bursa, employing a total of 26 people. Besides sales activities, they ensure local service, print repair and the availability of a strategic stock of spare parts. Picanol has an outstanding track record in production of high-tech rapier machines. Picanol launched its very first weaving machine with rapier insertion in 1975. Since then Picanol has installed over 90,000 rapier machines throughout the world. With industrial speeds of up to 750 rpm, the OptiMax-i is unquestionably one of the world's fastest rapier weaving machines in industrial production. Highlights of the new rapier include increased performance, more rigid construction, new applications, smart energy efficiency, improved ergonomics and user-friendliness. The OptiMax-i is available in reed widths ranging from 190 to 540 centimeters. Furthermore, with its Guided Gripper system (GC) and Free Flight system (FF) it is also a very versatile. The Guided Positive Gripper (GPG) system has been developed for dedicated technical fabrics. Meanwhile, additional features have been developed to meet the ever-increasing demand for versatility include among others the Electronic Filling Tensioner (EFT), the SmartEye filling detector and the SmartCut filling cutter. Machine configured to show the top speeds achievable with the OptiMax-i. 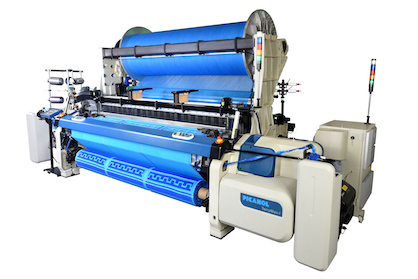 Picanol will also present its TerryMax-i rapier weaving machine, which has been developed for terry towel production. The direct electronic drive of the cloth fell mechanism guarantees a perfect pile formation and enables weavers not only to program the pile height loop by loop, but also to program the pre-beat-up distance of every single filling yarn, which in turn permits endless design possibilities. Special features include OptiSpeed, pile height monitoring and needle roller control. Besides the TerryMax-i, Picanol also has an airjet for terry production: the TERRYplus Summum weaving machine. This means that Picanol is the only high-end provider on the market offering both airjet and rapier terry machines. Picanol is also offering a terry machine on the proven rapier platform. The OMNIplus Summum is Picanol's high performing airjet weaving machine. It combines the latest technology with over 30 years of experience in airjet weaving. By introducing state-of-the-art technology in hardware and software, the OMNIplus Summum offers the next level to meet new market demands in terms of quality, performance and energy consumption. 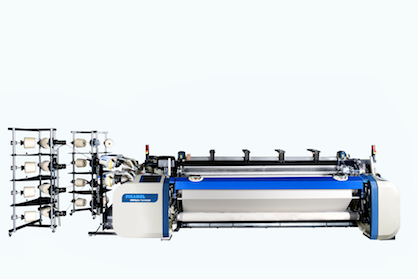 Built on the reliable BlueBox electronic platform, the OMNIplus Summum is packed with new features that enhance weaving performance and facilitate future improvements. The OMNIplus Summum is equipped with fully electronic pressure regulators, a separate built-in air tank for each weaving channel and a unique triple air tank configuration for the relay nozzles. This improves the user-friendliness and flexibility of the machine and significantly reduces energy consumption. Maximum speeds become possible without compromising on flexibility. ARVD II Plus, for lowest air consumption. The "performance" execution that brings an answer to the needs of bottom weight as well as denim weavers.